Many small business websites share a common problem. On average, around 95% of their website traffic leaves on their first visit without converting (either contacting your business or filling out a form on your website). For most small business websites with 1000’s or even 100’s of visits a month, converting even 1-2% more of those visitors can lead to a big change in their bottom line. The reality is however that those 95% of your visitors are not ready to buy. How do you convert a visitor who isn’t ready to buy? The answer is to use “lead magnets”. Lead magnets are valuable offers (commonly free pieces of content) that you give to consumers in exchange for a piece of contact information; usually their name and e-mail address. When set up correctly, lead magnets are a win-win for your business and the consumer. You win because you get a new lead to follow up with. The consumer wins by getting something that they find valuable for free. This value can be monetary (a free trial of a service that they are interested in trying) or non-monetary (free knowledge from an expert source). Lead magnets are effective because they offer something of value to your potential customers. As consumers become more and more wary of giving away their information online it has become tougher and tougher to generate leads. Most consumers today are not willing to give away their information for nothing. In order to get something valuable from your website visitors (their e-mail addresses) you now have to give them something valuable in return. Consumers are hungry for information. They scour the internet looking for ways to solve various wants and needs. If your website offers information that can help solve their wants and needs, most are willing to give something up (their e-mail address) in order to get it. To fully understand how lead magnets benefit your small business though we must first quickly take a look at the changing consumer sales cycle. Most people are familiar with the traditional consumer sales cycle, showed here in a simplified form. 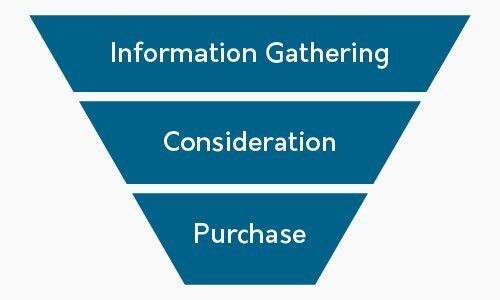 The traditional consumer sales cycle. After recognizing a need, consumers typically go through three main steps, information gathering, consideration of their options and making their final purchase. Until recently, the information gathering and consideration stage looked essentially the same. Before the rise of the internet the only real place to get information, other than from friends and family, was retail stores. Consumers would go from store to store to ask salespeople questions and collect brochures; in some cases visiting upwards of 10+ stores before narrowing down their choices. Businesses relied on their salespeople to sell the benefits of their product or service, collect lead information, and follow up with their leads. If the salesperson did their job well, the consumers would eventually decide to buy from them. The internet has completely changed this buying process. Manufacturer and retailer websites, online forums and review sites have effectively taking over the information gathering phase. In fact, over 80% of consumers now gather information online first and will spend an average of 79 days gathering information before making a major purchase. While the majority of consumers still make their final purchase in-store, the information that they gather online inevitably influences their final purchase decision. It is now commonplace for consumers to only enter 2-3 retail stores before making their final purchase decision, having already narrowed down their choices based on what they found online. Educate the consumer about your product or service. Influence their eventual purchase decision, by demonstrating the advantages of your product or service has over your competition. Follow up an offer to bring them to your store once they are further down the sales cycle. By capturing leads at the information gathering stage, you give your business a huge leg up over your competition. Before the consumer even steps into your showroom they are already familiar with your product or service, understand its advantages, and now have a reason to buy. In attempting to generate more leads, small business websites have employed many different tactics. Most of these tactics, however, fail to help. The Buyer. Someone that has done all of their research and is looking to make a purchase in the very near future. The Customer. One of your existing customers. They are typically looking for things like store hours, product manuals or your contact information. The Information Seeker. The vast majority of your website traffic. These consumers are in the early stages of the buying process and are just looking for information. They have no intention of buying anything at this time. Most marketing tactics are designed to persuade consumers to make a purchase. While they may effective in closing the 5% on web traffic that are looking to buy, these tactics don’t do much for the other 95%. This is a problem because for most small business websites the only other way visitors can convert is either by contacting the business directly (through the website’s contact page) or through a “subscribe to our newsletter” lead form. While not as direct as other tactics, these methods are not effective ways to convert information seekers. This is because they don’t provide any value to the information seeker. Remember, these people are only looking for information; they’re not ready to talk to a salesperson and are therefore not likely to see value in contacting your business. There is also not much motivating them to sign up for a newsletter. The only thing most consumers see when they think of company newsletters is spam. Recently, some companies have begun using what we will call popup offers in an attempt to close more information seekers. 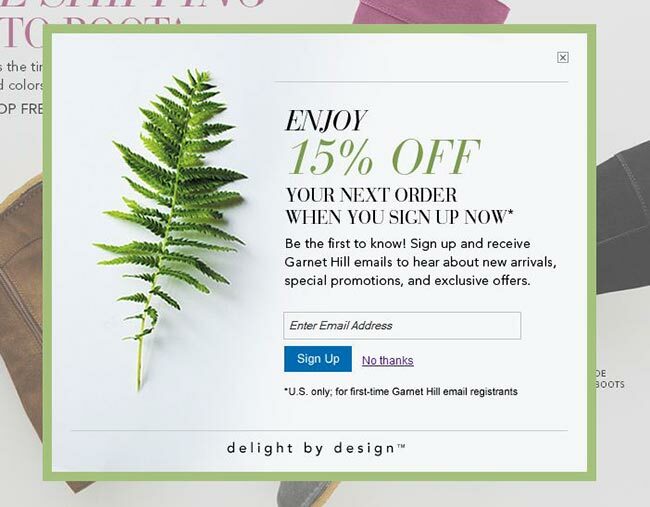 Often times this takes the form of a pop-up offering a discount on a product or service if a visitor signs up for the company newsletter. The problem with popup offers is the same as before, it offers little value to those not looking to make a purchase. These tactics can even have a negative effect on conversions as consumers get annoyed with the popups and leave. Even if they do sign up, how do you know which product or service they are actually interested in? How do you effectively follow up with the leads? While popup offers like these can be effective for closing consumers that are ready to make a purchase, they don’t offer much value to the 95% of website traffic that are not ready to buy. Lead magnets can solve both of these problems. Effective lead magnets give information seekers the expert information that they crave, creating a compelling reason for them to give you their contact information. If designed properly, they can also be used to qualify that lead. For best results, build several lead magnets that each focus on a particular part of your business. Now when you get a new lead you know exactly what they’re interested in. You can then deliver a targeted follow up that will continue to build value with your new lead, further increasing their chances of eventually buying from you. One of the biggest challenges of marketing your business online is how to convert your website traffic into leads for your business. If you are one of the many businesses struggling to turn website visitors into leads, you need to start using lead magnets. Capturing leads early in the buying cycle allows you to remain in the forefront of their mind and influence their final decision. This gives you a much greater chance of closing them when they eventually decide to buy. While creating lead magnets can be simple, creating lead magnets that generate targeted leads can be challenging. Already using lead magnets? 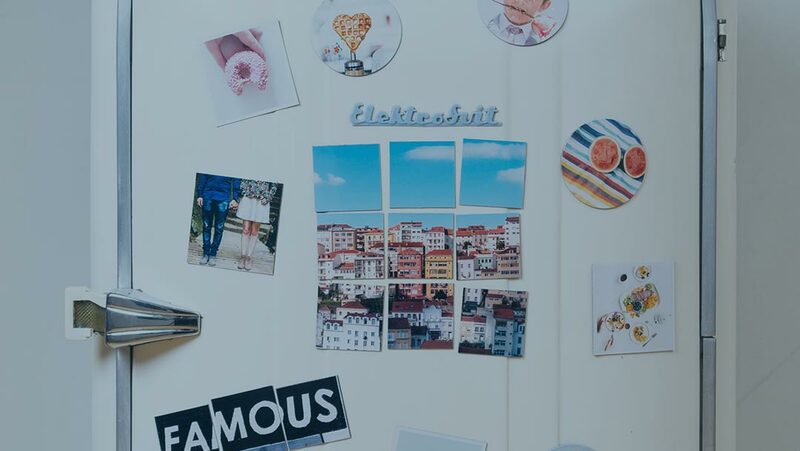 Here are 6 essential lead magnet design tips to help you increase their effectiveness!